"coordinating the outfit with the style of the actual wedding".. When looking for your mother of the bride dress, there are a variety of things to consider, like style, colour, and etiquette (refer to our Mother of the Bride Dresses 101 for specifics). 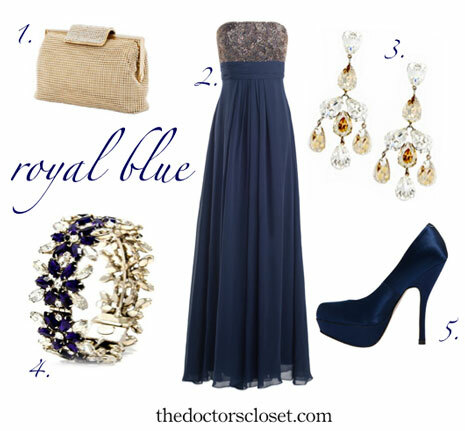 But, one very important consideration is coordinating the outfit with the style of the actual wedding. Ultimately, mom knows best what colours and what silhouettes suit her. But, here are a few suggestions from the experts at Blush Bridal to help guide her in finding the right dress for the event. Illustrating each case, Monika Hibbs' great styleboards (theDoctorsCloset.com). Wear a dress that has some movement to it. 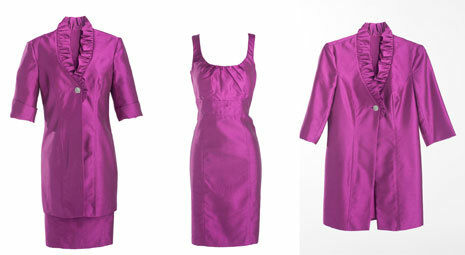 A dress of silk chiffon will move gently in the breeze and keep you cool at the same time. This beautiful silk chiffon V neck dress by Amsale is an excellent example. This dress has a V-neck which elongates the body and provides the perfect place for a great piece of jewellery. It stops just below the knee and has a skirt that gently floats over the body. You can pair it with a matching wrap for a bit of arm coverage. Colors like burgundy, teal and charcoal are hot colors right now and can coordinate easily with the wedding party. Wear a slim multi-layered dress with a delicate pattern like this one from JS. The delicate pattern is perfect for a garden full of summer or spring blossoms. 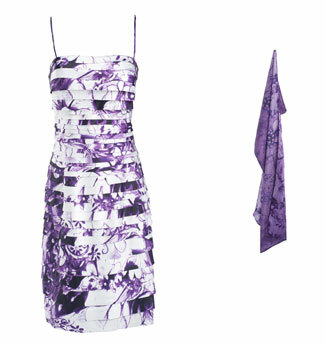 Accessorize the dress with a coordinating wrap or be daring and wear a great hat or fascinator. The modern dress/coat ensemble is a chic option. Slip on the 3/4 length chic jacket for the ceremony (bunch up the sleeves for a more contemporary look) or take it off to reveal an attractive A-line dress perfect to dance the night away. 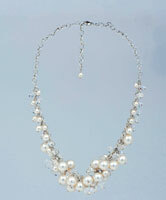 You can accessorize the ensemble with a fabulous necklace - bold and strong- like this fabulous piece by Elsa Corsi. 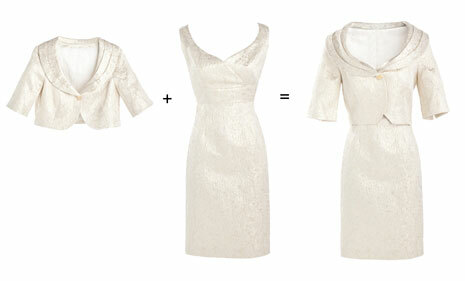 Try this slim dress with bolero in a beautiful gold brocade fabric. This dress which ends just below the knee gives you a long unbroken line and the gold is elegant and easy to wear with most skin tones... Its gentle shimmer provides a more luxurious look. Consider this beautiful, delicately beaded gown by Theia. Its silk chiffon skirt will float you down the aisle with style and grace. This wonderful pale pink chiffon dress offers light, feminine movement. Play with the accessories to make it work for either a beach or garden wedding or glam it up for a formal evening affair.